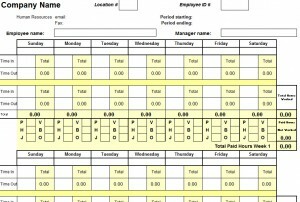 Easily keep track of your employee’s hours and pay with the free Biweekly Time Sheet Template. This template includes everything you need to calculate the next month of an employee’s schedule, and any additional information necessary to organize your business or organization. This template works perfectly for any Fortune 500 company, small business, and non-profit organization. Simply download the file below and select an easily accessible location on your computer. Click on the file to open the template. With the file open, you can see how simple the Biweekly Time Sheet will make keeping track of all your employee work information. The template includes all the basic information you will need in order to fill it out completely. The Time Sheet gives you, or your employee, the ability to write down the time they start a shift and the time their shift is over for the next four weeks. At the end of each two week period, it will conveniently list the number of hours your employee worked, and the number of hours they were supposed to work but didn’t. A legend, located near the bottom of the screen informs you about the lettering system and their meanings, located throughout the template. These are used to indicate the various reasons why an employee did not work their scheduled shift. In addition to the simple format, any information can be easily customized to fit your industry, simply by clicking on a cell and typing over the previous data. Once all of the information has been properly formatted to suit your organization, you are ready to print the document by clicking “File” in the top left corner of the page, and then selecting “Print” or “Print Preview”, if you want to see how it will look on the page prior to printing the template. Why Use the Biweekly Time Sheet Template? If you want to avoid the frustration of jotting down this information each week, and save a lot of time and money doing it, then this template is the perfect tool. Quickly email or post your employees schedules, and keep track of all their work hours in one simple and easy to customize document. This template leaves no stone unturned when it comes to tracking work hours. Save yourself the time and effort by downloading the Time Sheet Template for free.